I'm a junior studying Anthropology, International Studies, and Global Health. Having studied or worked with global health initiatives in three different countries, I believe that health is a fundamental component of allowing a life to be lived to its fullest potential, and that that potential ought to be realized out of respect for human equality and global improvement. I am currently researching the community health worker model in Peru, a project which has necessitated extensive background research on Peruvian health care and the community health worker model’s past, present, and potential in the country. This background research included information on the Community Health Administration Associations (CLAS) program, a program that diverges from the conventional community health worker model but provides community-based primary care nonetheless. As a background, the community health worker model is a primary care model wherein local community members are trained to administer basic health services to other members of their community. This model is steadily gaining popularity worldwide, often commended for its potential for community empowerment and accessibility. In Peru, studies of the community health worker programs in place acknowledge the efficacy of the model on paper, but criticize the fact that the bulk of Peruvian community health workers are males with little to no education that exhibit high dropout rates from their community health work (Brown et. al. 2006). However, the CLAS program, implemented in 1994, is proving to heighten the potential of efficacious community health work. The WHO defines the CLAS program as a system of “private, non-profit civil associations [(legal non-profits)] that enter into agreements with the government and receive public funds to administer primary health-care (PHC) services applying private sector law for contracting and purchasing” (CITE). These individual community CLAS associations effectively identify local social determinants of health and health inequities, and then reinvest their Ministry of Health-supervised budget in community outreach programs and infrastructure development. As it relates to the community health worker model, the CLAS program is essentially a government health initiative with authorized and integral community participation. Health personnel working at CLAS associations are formally hired by CLAS and are held accountable by the community members their center works with, thereby necessitating transparency and communication with service recipients. In that way, community members influence the health services offered, and CLAS associations respond to the needs and health disparities specific to their localities. All in all, the CLAS model has proven to have favorable impacts on health, health services development, and community outreach. CLAS association clinics boast significantly higher numbers of staffing physicians in comparison to non-CLAS clinics (and therefore shorter waiting times and more personalized treatment) with a higher average of annual clinic visits among their target populations. The centers also exhibit higher access and more customized primary care, especially for poorer rural populations that tend to be dissuaded by unaffordable fees. They do so by focusing on what the individual community needs and responding to only the relevant inequities and necessary services–in short, affording accessibility by efficient service development and implementation. Government and organizational initiatives continue to develop in the hopes of further strengthening the CLAS program by monitoring impact, fostering community-based education, broadening the reach of CLAS centers, and increasing CLAS partnerships with schools, organizations, and other relevant institutions. With initiatives like this in place to strengthen a program that already demonstrates significant impact, it is exciting to see where this community-based primary health care system goes in the future. 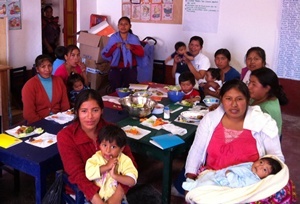 Likewise, it will be interesting to see how non-CLAS community health worker programs interact with, borrow from, and impact the CLAS model to continue to expand the reach of community-based health care in Peru.